One of Kona’s original condominium complexes, Casa De Emdeko is known as the meeting place and the Crown Jewel of Alii Drive. Fashioned in Mediterranean-style architecture, the complex offers visitors and residents alike the perfect blend of Hawaiian ambiance with lush gardens and majestic Pacific Ocean views. You’ll find a one-of-a-kind oceanfront salt water pool next to a private, sandy beach area at the ocean’s edge. Both offer glorious sunsets and fastastic seasonal whale and dolphin watching. Or enjoy the tropical garden fresh water pool within the courtyard – where you can soak up the sun or take a cooling dip! The tropical garden also includes a gushing waterfall feature, attracting many of the local Hawaiian birds and offering a relaxing environment to enjoy the birdsong. A cabana offers a space for barbecues with ample tables, and is a great meeting place for friends and acquaintances old and new. 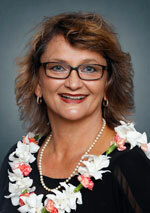 Derinda Thatcher is a transplant from the Canadian Rockies and has been a licensed real estate agent in Kailua-Kona since 1990. She has won a multitude of awards, including Realtor Associate of the Year for the Kona Board of Realtors ’93, Consistent Top Producer for Clark Realty Corporation for a number of years, and a Lifetime Achievement Award in 2017. Can I Afford to Live in Hawaii?